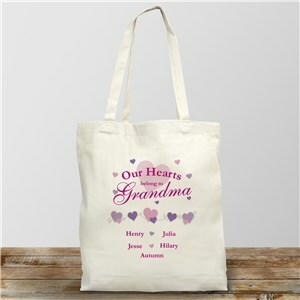 Show off your kids or grandkids with our Our Hearts Belong To personalized shirt design for Grandma, Nana, Mom and even Auntie. 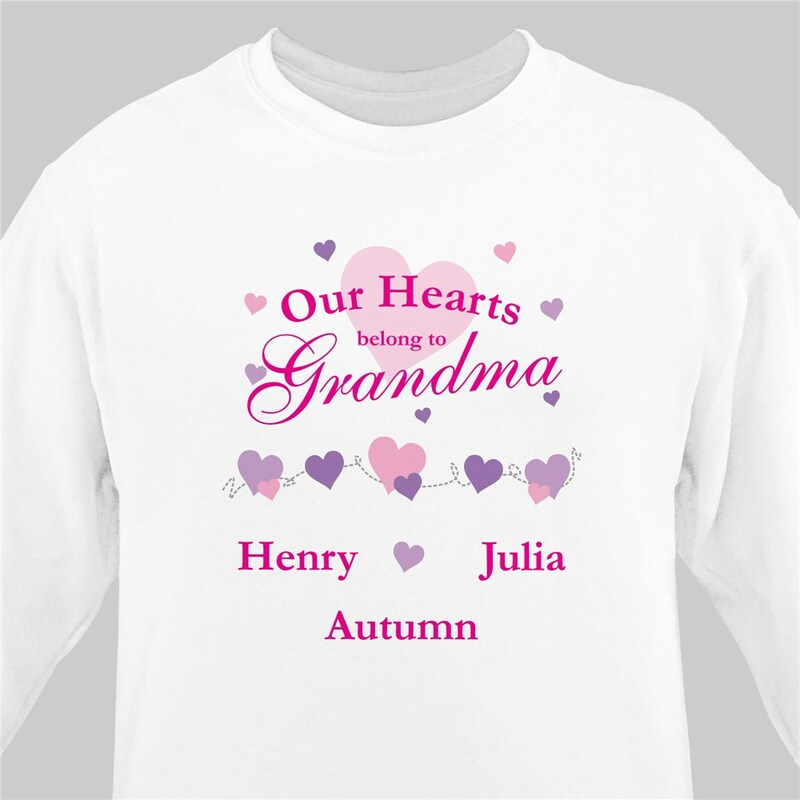 This custom printed heart sweatshirt is an ideal personalized gift for Valentine's Day, Mother's Day, special Birthday or Anniversary. Your new Personalized Shirt for Mom or Grandma is available on our premium white cotton/poly blend Sweatshirt, machine washable in adult sizes S-3XL. 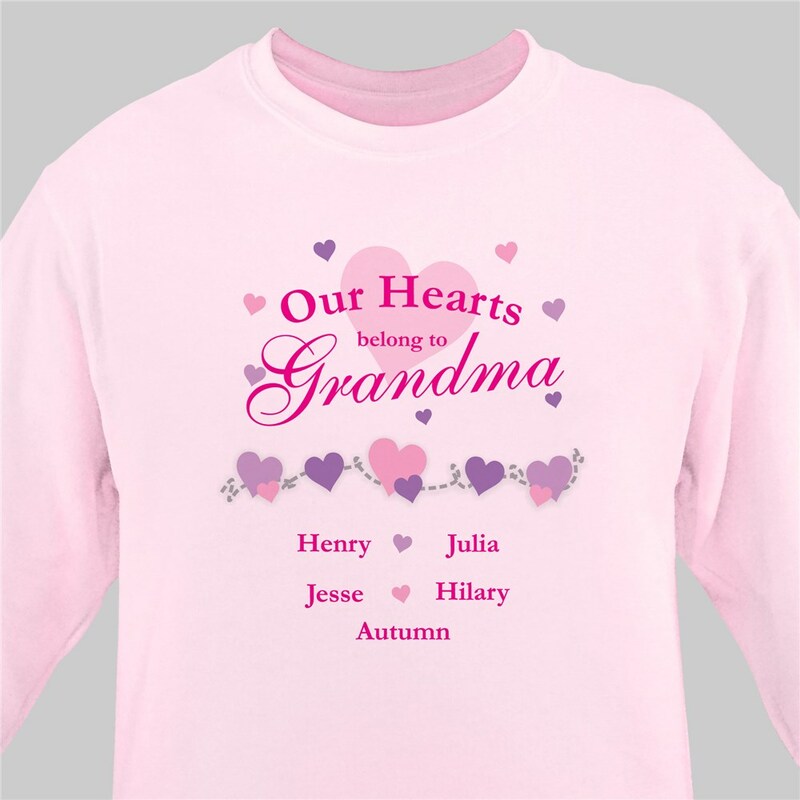 Our Personalized Grandma Shirt includes phrase and hearts printed in pinks and purples. Shirt for mom or grandma includes free personalization of any title, Mom, Grandma, Nana, Great Grandma, Gram, Granny, Nonna, Abulea or Babcia you choose or create your own and up to 30 childrens names. Getting personalized gifts for my Nana are so hard to find. Thank you for making my gift to my Nana so special. Thank you very much my grandma will love this. Thanks for putting mom mom instead of grandma. Thank you for making Nana gift so easy. Our personalized sweatshirt for Grandma or Mom makes a great gift from the kids. We have Mothers Day shirts, Mom Shirts, Grandmother shirts, Grandma shirts, even Granny shirts, and shirts for Moms, shirts for Grandmothers, shirts for Mothers and shirts for Grandmothers. Shirts for Grandma also make unique Grandparent's Day gift ideas. Looking for the perfect Valentine’s Day shirt for Mom or Grandma? We have Valentines Day Shirts for Mom, Grandmother, Grandma, even Granny. Check out all our Valentine's Day Personalized Apparel today.